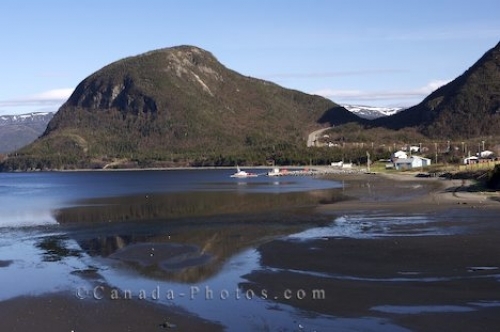 Large mountains make up part of the scenery along the coastline of Blow Me Down Provincial Park in Newfoundland, Canada where you will also find the small fishing village of Lark Harbour. Blow Me Down Provincial Park is an excellent place for family hikes as the trails are fairly easy and the lookout points throughout the park have incredible scenery. Looking across Lark Harbour towards the Blow Me Down Provincial Park on the South Shore of the Humber Arm west of Corner Brook, Newfoundland, Canada. Picture of the sandy coastline near Blow Me Down Provincial Park just west of Corner Brook, Newfoundland, Canada.